Sociologist Wendy Cadge notes in her recent book that chapels have been attached to hospitals since at least the twelfth century. 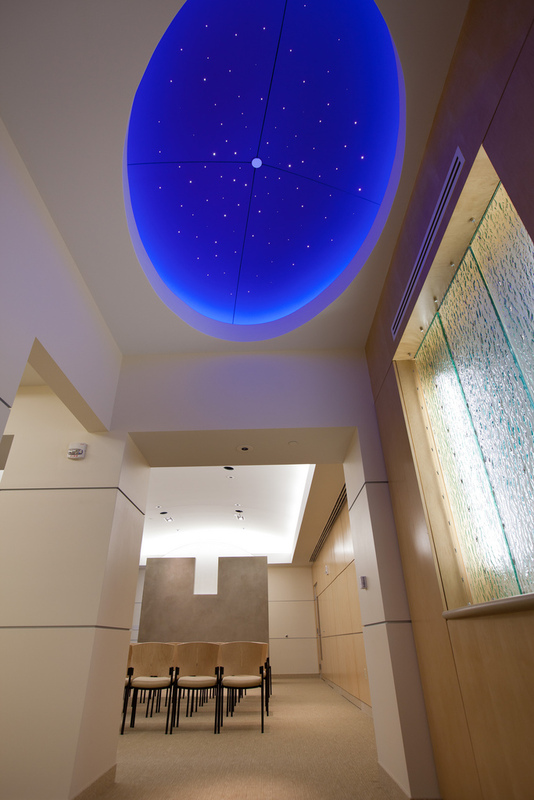 Although chapels have hardly been a uniformly present aspects of hospital architecture in the intervening centuries, many if not most contemporary hospitals in the US and Europe include some space set apart and designated as a chapel or space for prayer. Frequently, hospital prayer rooms and chapels are “non-denominational” and contain objects for worship and for prayer that can be used by many religious groups; bibles, hymnals, prayer rugs, and the like are stacked against the wall, pews are replaced with chairs or, in some cases, with cozy sofas. Cadge’s book focuses on the changing role of religion in American hospitals and is based on ethnographic work in a number of major teaching hospitals. An early and fascinating chapter focuses on hospital chapel architecture, paying attention to the ways that contemporary chapels compare with those that came before. As Cadge notes, a large number of private American hospitals built by religious groups had chapels overseen by chaplains or priests from those faiths. In the intervening decades, many hospitals lost their religious charters or became linked to broader private partnerships; likewise, the client base of American hospitals expanded religiously. As a consequence, the chapels of American hospitals have largely been retrofitted, redesigned, and repurposed. The most widespread (though hardly uniform) changes are hospitals’ shift from the model of a “chapel” (which may designate a particularistic or Christian identity) to a “meditation and prayer space” that can be used by a wider diversity of people. As Cadge notes, however, these new prayer spaces mark not only a shift in the presumed religious identity of the visitor (toward a more pluralistic set of identities, practices, and needs) but also a changing understanding of prayer’s role in hospital care. While not that long ago chapels were used by patients and their families as well as health professionals, most prayer rooms today are located well away from patients, typically near the hospital entrance and gift shops. She notes that as hospital stays become shorter, and those who stay are less ambulatory, collective religious services for patients are rare occurrences. Instead, chaplains visit patients bedside, and the chapel becomes a place for private reflection and prayer by others. Cadge stresses that this shift in the placement and use of chapels does not mean that hospitals have become uninterested in the religious experience of the patient. On the contrary, meditation and prayer are often viewed as potentially helpful to the healing of the patient, and contemporary chaplains are often enlisted to play a more integral role in recovery. While chaplains thus are still on hand to sit with the bereaved and to listen and attend to those who are suffering – and, as is necessary, to provide last rites or other ritual functions – they are also on the cutting edge of elaborating a quasi-secular, medical and multi-faith use for prayers in modern medicine.